Do you want to spend the summer coding on Gazebo or ROS? Open Robotics has been accepted for GSoC and we are looking for talented students who want to participate as remote interns. Accepted students will participate in real-world software development, contributing to open source robotics projects and engaging with the global robotics community, all while getting paid. Get ready for a robotics coding summer! 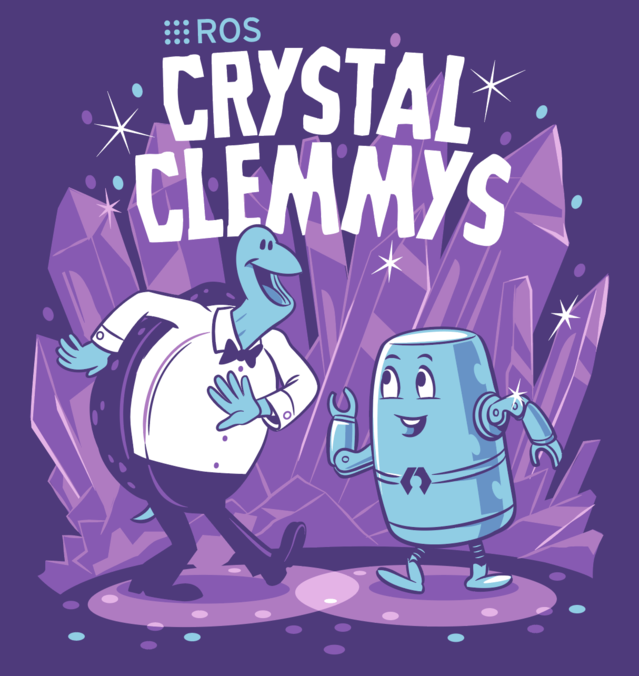 We're happy to announce the ROS 2 release Crystal Clemmys! Check out our installation instructions and tutorials and give it a try! We're excited to hear your feedback and the applications that this release will enable! Our ROS 2 distros, they grow up so fast. With the release of Crystal Clemmys we also bid farewell to Ardent Apalone which will retire with 191 packages, and Crystal is debuting with almost 300 (297 to be precise)! To get an idea of what's in this release, be sure to read the Crystal release page. Crystal Clemmys is the third ROS 2 release and will be supported with bug fixes and platform updates (particularly on rolling dependencies like Windows and MacOS) for one year with support ending in December 2019. While we do aim to keep the API as stable as possible, we can't guarantee 100% API compatibility between releases. Check the features page and ROS 2 roadmap to evaluate whether or not ROS 2 is ready to be used for your application or if you can switch from ROS 1 to ROS 2 as it will depend on the exact feature set and requirements of your use case. We also invite you to release your ROS 2 packages in Crystal! Here's a tutorial to do so. A huge thanks to all those who've already participated in our pre-release testing and packaging effort. P.S. There's still a couple of weeks left on the T-Shirt campaign. Looking foward to ROSCon 2018 we're highlighting presentations from last year. Justin presents a new approach to building web interfaces for ROS applications. This talk will introduce a set of web components, built on top of Robot Web Tools, that make it easy to build complex, ROS-integrated web applications without writing much code. Using the Polymer library with these components helps to make applications that are accessible and mobile-friendly. We will show how to use these components and show some common web programming patterns. Additionally, we will showcase some complex web applications we have developed with these tools, including a programming by demonstration interface, a web-based version of RViz, and a ROS graph explorer utility. The first officially licensed local ROSCon event, ROSCon JP 2018, was held in Tokyo, Japan on the 14th of September. ROSCon JP 2018 was held in conjunction with the Open Source Robotics Foundation. 189 people participated on the day (excluding sponsors' invitations and staff). The livestream had a steady 60 to 70 people watching at any one time throughout the day. Thanks to all the participants, ROSCon JP was an exciting day for all. Presentation slides and videos will be published on the website in a few weeks. A catered lunch and reception and a popular exhibitors' hall provided many opportunities for participants to mix with each other and make new connections. As our first event, we consider ROSCon JP 2018 to have been a massive success and a credit to the Japanese ROS user community. Continue reading ROSCon Japan 2018 Successfully Concluded. Chris presents a new approach for integrating ROS using Node.js as an alternative to the rosbridge suite. Michael presents on how to bring ROS into safety critical systems. This presentation gives an overview about our "Kontrol" development environment for safety critical controllers using ROS and Gazebo. We first analyze existing standards for safety critical controllers for different applications and present the results of an extensive industry survey which concludes that 70-80% of the development costs are spent during the serial development phase. To overcome this burden, we present our approach of a model-based development environment which significantly reduces this cost. We show how ROS and Gazebo can be integrated into one development tool. Finally, we demonstrate the automatic code generation for ROS and ROS2 nodes using Scilab. Ingo presented how determinism can effect a robotic system. The talk provides an overview of causes of non-determinism. Followed by specific examples of diagnosing determinism in a robotic system and the benefits of eliminating the sources of non-determinism. ROS's foundational style, the asynchronous, loosely coupled compute graph, is great for re-use and distribution, but there's a catch: Nothing guarantees execution ordering. This means, the order in which callbacks and timers are executed can change even when inputs are the same. In many important cases, this leads to different results, and - subtly or not so subtly - changes the robot's behavior. As an example, in the common movebase node, we found reaction times changing between 50 and 200ms, while pure computation time was only 20ms. I will show why this happens, and how to address it, both in the movebase and in general.